I. On a platform of lances on the backs of crouching Huguenots, a Jesuit supervises a dragoon tying five Huguenots together with a chain, one of whom is a naked woman. 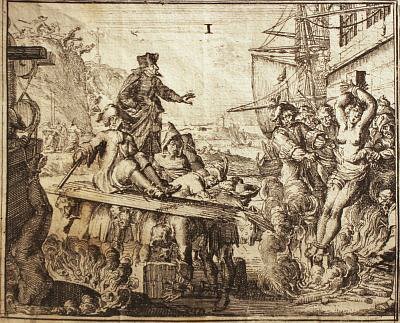 There is a ship in the background onto which they will be deposited.To the right of the foreground, a Protestant is being flung head first into a well around which a fire is burning.